The Ariegeois is a hunting dog that usually is engaged in small game hunting. 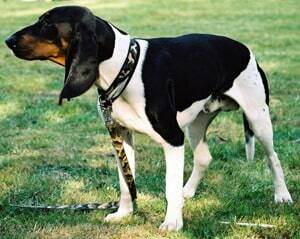 The origins of this medium sized hound are French and first appeared around early twentieth century. These dogs are known for their affectionate nature, but often they manifest as quite reserved animals. Despite this fact, the Ariegeois are also calm in nature, extremely rarely showing any signs of aggression, which helps different handlers to easily work with them, both in hunting and in different types of work. They are also suitable for keeping indoors, being good companions. Generally, the Ariegeois can only gain up to 30 kilos in weight and rarely go past 60 centimeters tall. Females are a bit smaller in both height and weight. Their coats are short and they come in colors such as white with black or with tan/liver, but with the white as dominating color. They resemble pretty much with the Gascon-Saintongeois. The Ariegeois are athletic and endurable and have a very good sense of scent. They have solid built chests and their throaty bark is well known. Excellent hunting dogs with preference for small game and hares, these dogs come from Ariege, a French province and they are the result of a pairing process that involved Grand Gascon-Saintongeois, Grand Bleu de Gascogne and Briquet hound breeds. Spock The Dog Copyright © 2019.